In lieu of a “previously on” segment, we open this episode with a personal log from Michael Burnham (Sonequa Martin-Green). I’m beginning to think that the other voiceovers have seemed to jarring to me simply because they aren’t explicitly identified as log entries. But anyway, Burnham’ tells us that her mother always told her that mysteries come in threes – birth, life death; past, present, future; no third example. They now know that the Red Angel is a humanoid from the future wearing an exosuit of advanced tech. But they still don’t know why. And the only one who might be able to tell them is Spock. 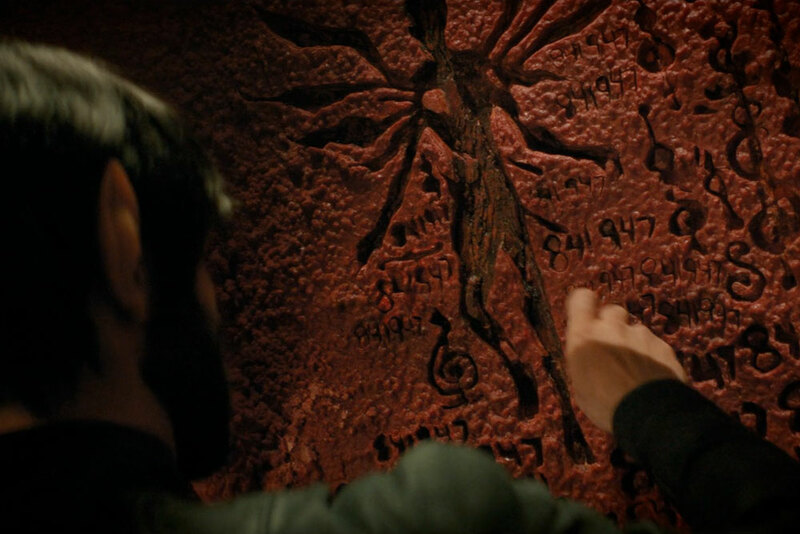 Burnham reminds Pike (Anson Mount) that Spock began drawing the maps of the seven signals a whole two months before they started appearing, which only confirms for Pike that there’s a connection, and either the Red Angel “broke” Spock or chose him because he was “broken,” even suggesting that it showed him a future he could not process. Burnham repeats again what they know about Spock’s escape from the medical facility, but there’s no new information. She wants to go to Vulcan to speak with her parents, as she thinks that Amanda may be hiding some information. Pike grants Burnham her leave, and explains that Discovery will be remaining at Kaminar for awhile as they investigate some residual decay from the signal in hopes of learning more about it. And an alarm starts blaring, so Pike and Tyler leave the command dais. Comms and tactical systems are offline, and Owosekun (Oyin Oladejo) reports that the computer is caught in some sort of loop caused by a temporal anomaly. Just then, Tilly points out a temporal echo, and the whole crew watches the Tyler and Pike confrontation play out again, as it just had. On screen, Detmer (Emily Coutts) has located a rift in spacetime. As the rift opens, Discovery is jostled, and the systems come back online. Pike’s decided that they will launch their probe from a shuttle, and he’s going to pilot it. After all, he’s the most qualified. Tyler takes it upon himself to accompany the captain. The tension still thick in the turbolift, Pike finally expresses why he distrusts Tyler: Voq, and specifically what he did to Culber. Phew. Time for the opening credits and we’re already 5 paragraphs in. Settle in – looks like this one’s gonna be a doozy. Burnham arrives on Vulcan, and as she walks through her childhood home, she remembers the first time she did so, how she acclimated, and how she began bonding with Spock. Amanda (Mia Kirshner), whose dress is amazing and gives off a real General Organa vibe, tells her that Sarek (James Frain) has been practicing tokmar daily – a meditation that “Ancient Vulcans believed could bring lost souls back home.” It isn’t working, but Michael thinks more is going on. Amanda continues to deny that she’s hear from or seen Spock. Michael makes a final plea; She just wants to help him. The shuttle is slowly approaching the temporal anomaly, keeping an eye out for distortions, while the power struggle between Pike and Tyler continues in the cockpit. The first sign of temporal distortion appears on Disco as Saru gives Pike the go-ahead to launch the probe. Pike puts on the breaks, and sees a temporal echo of himself shooting at Tyler. He shakes it off, and they launch the probe… sending a temporal shockwave right back at them, and suddenly the shuttle is lost in the time rift. Saru doesn’t miss a beat and confidently takes charge, refocusing the mission to rescue the shuttle, and ordering specific instructions across the bridge. But Tilly is skeptical – time is not linear within the anomaly, making locating the shuttle nearly impossible. But just like the Eighth Doctor, Stamets (Anthony Rapp) has a unique relationship with time, thanks to his tardigrade DNA. Amanda and Michael arrive in another location on Vulcan. A cave? Temple? As the doors open, we can hear Spock (Ethan Peck) muttering to himself, almost in a trance. He doesn’t acknowledge their presence at all, but continues to recite the first doctrines of logic and repeat a string of six numbers. Michael wants to take him to a hospital, and Amanda refuses. She event threatens to use her status as the wife of an Ambassador to invoke diplomatic immunity… but not if Sarek objects. See, he followed them there. In the time rift, Pike and Tyler are arguing about the best way to get back out. Pike orders Tyler to vent three bursts of plasma, which will be ignited by the thrusters, giving Discovery a way to track their flightpath. Tyler thinks this is bonkers – they’re going to need that fuel. Tyler again accuses Pike of making decisions based on his guilt over missing the war, but Pike’s had enough and threatens to throw Tyler in the brig for not following orders, if/when they ever get back. 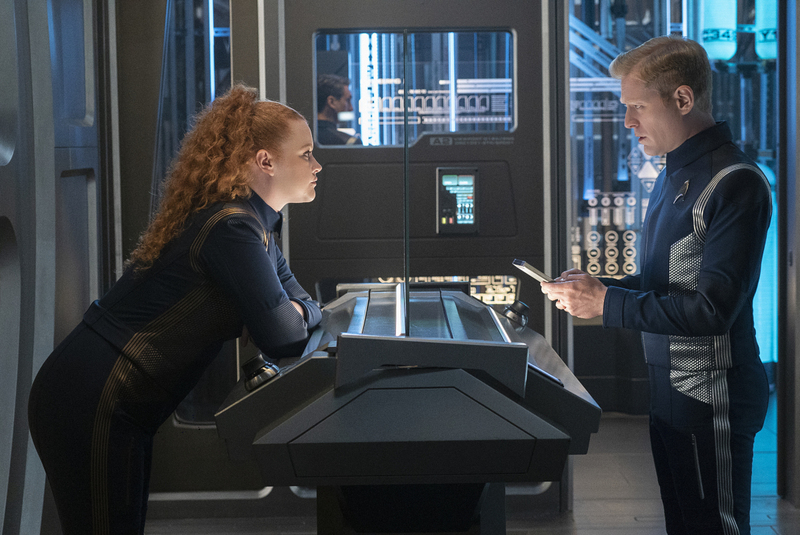 In the science lab, Tilly is bringing Stamets up to speed on the shuttle situation, but even with his connection to the mycelial network, this isn’t going to be easy. And they’ve only got about 4 hours before the exposure is lethal. Let’s take a brief intermission for a canonical rabbit-hole: Sarek says “both of our children.” As a reminder, Sybok is not technically one of their children – he’s the son of Sarek and a Vulcan princess. But neither is Michael. 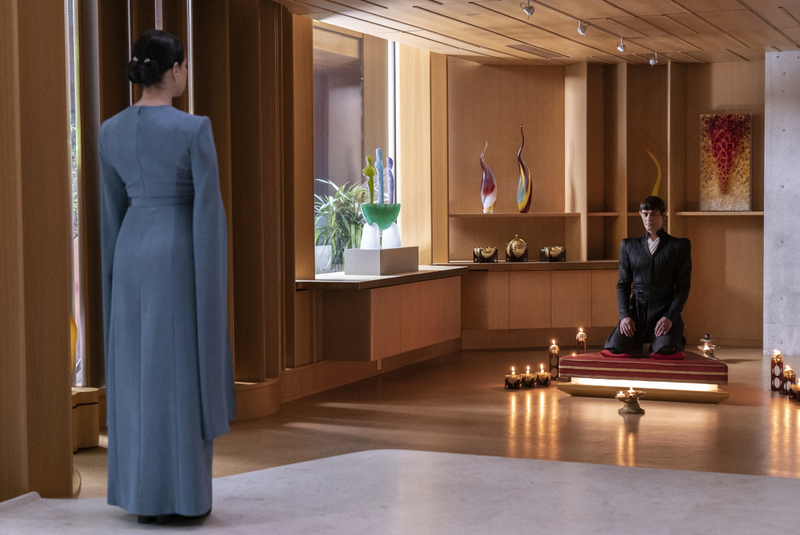 To make sure we get the timeline right, according to Memory Beta, Sybok was born in 2224, Burnham in 2226, and Spock in 2230; Which would lead one to believe that they all grew up together, raised by Amanda and Sarek. 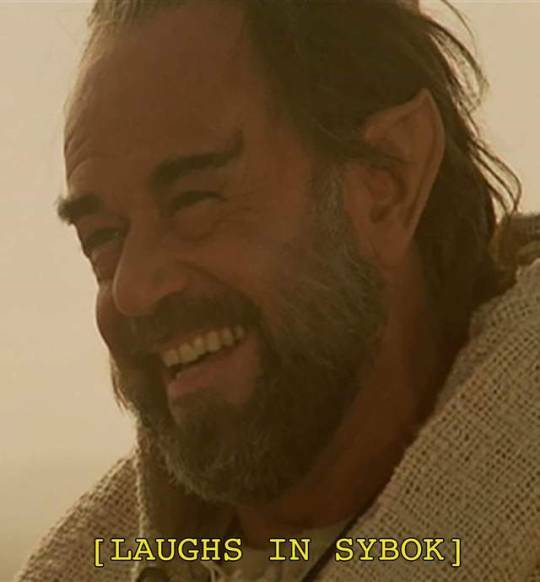 So if Burnham is one of their children, why isn’t Sybok? Anyway, back to the time rift. The shuttle’s systems are failing and they’re being pulled towards the rift’s aperture. Tyler blames Pike and his guilt for getting them into this situation, just as something impacts their shuttle. It looks like the probe they’d just launched, but with significant “upgrades” of future tech, and it attacks the shuttle like a giant robotic space squid. Burnham and Spock arrive at Leland’s ship, and Section 31’s doctors sedate Spock. Leland (Alan van Sprang) promises that they’ll take good care of Spock, and asks Burnham for anything she can share about him. She tells Leland that Spock was diagnosed with L’tak Torai as a child, which he calls a “spatial and order dysphagia, much like dyslexia.” Leland encourages Burnham to go to Starbase 23 and relax for a while – the doctors won’t know anything for awhile anyway. After Leland leaves the exam room, Michael shares a moment with her brother, thinking back over all he’s been through. That’s when it dawns on her that the number he was reciting in the crypt must be backwards (that’s not quite how dyslexia typically works). 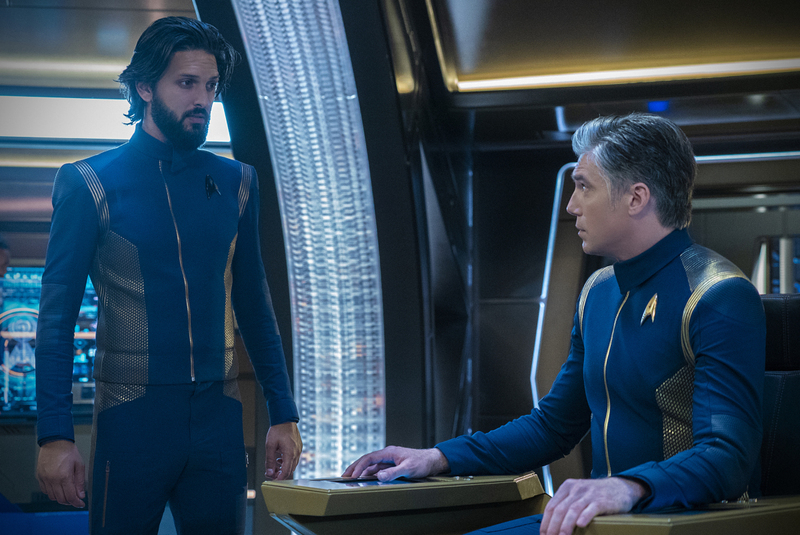 On Discovery, Lieutenant Rhys (Patrick Kwok-Choon) is detecting traces of plasma bursts – it’s an old trick he learned in flight school, just like Pike. Saru has him send the coordinates to Stamets, who can use them to calculate the shuttle’s trajectory. Tilly can’t wrap her head around the 4-D math (which I don’t buy, because she’s done way more complex math than this on this show), but Stamets tells her that her calculations are correct, it’s just the nature of nonlinear distortions. But he can handle it by plotting the coordinates of each plasma burn against corresponding coordinates in the mycelial network… to find that the shuttle it drifting towards the aperture. And in such an anomaly, spatial orientation is meaningless, but not to him! Pike and Tyler put up some kind of plate shielding, and try to get a reading on the robosquid: some of the metals aren’t even on the periodic table, and the computer says it’s aged 500 years. Suddenly, the tentacles breach the shutte’s hull, and one of them has Tyler around the neck. As Pike picks up his phaser to shoot it, he realizes that this is the scene he saw play out before him a the start of their mission. He shoots, and the tentacle falls from Tyler, but then part of it activates and impales itself in the access console and starts accessing the shuttle’s database. As Pike and Tyler approach it, the tech releases a pulse, knocking them back. 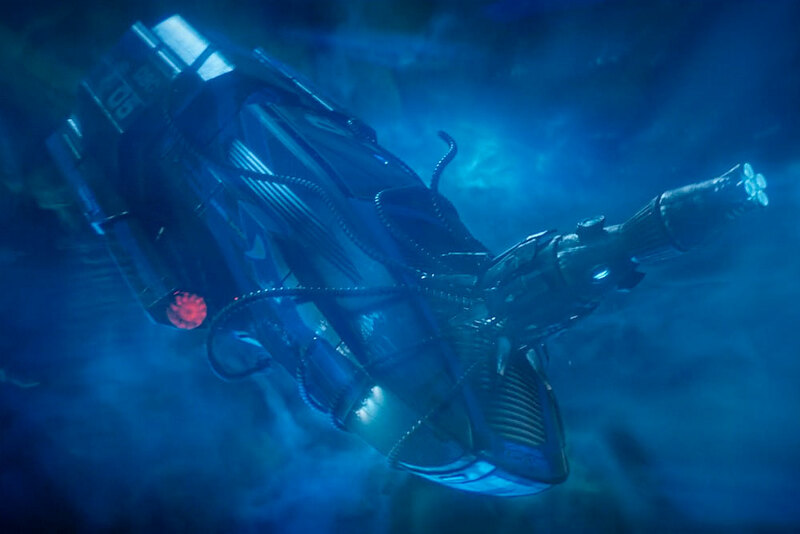 Stamets, Tilly in tow, is running towards the transporter room. He knows Pike and Tyler can’t fly themselves out of the anomaly, but he can. And Tilly’s going to transport him onto that shuttle. What? Tilly starts freaking out, still unable to intuit the nonlinear nature of the distortion – What if it doesn’t work or the calculations are off? 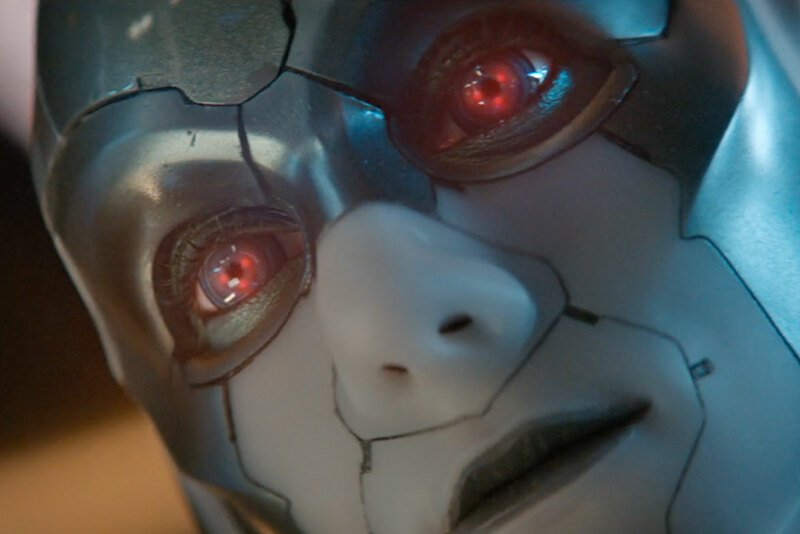 Stamets tells her to trust the math and trust herself. She steels herself and energizes. Stamets materializes on the shuttle, and takes the helm, much to the surprise of the other occupants. Tilly runs onto the bridge as the shuttle is exiting in the anomaly, complete with robosquid. The consoles on the bridge are mirroring the shuttle’s screens, and Airiam (Hannah Cheesman) attempts to block the tech’s access while the rest of the crew figures out how to retrieve their shipmates. They’re unable to get a transporter lock, so Stamets attempts to pilot the shuttle closer to Discovery, but they’re out of gas and starting to be pulled back into the rift. 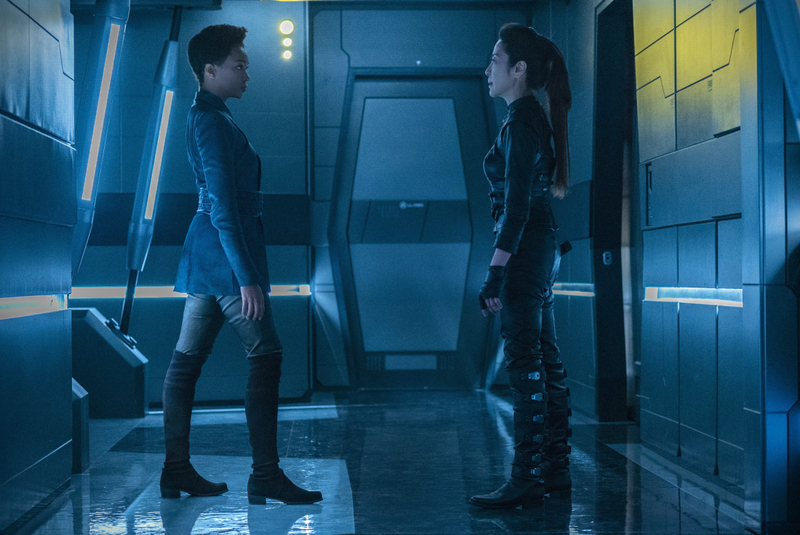 As Burnham is leaving Leland’s ship, she’s intercepted by Georgiou (Michelle Yeoh), who tells her that the machine they’re hooking Spock up to is a memory extractor, which will destroy his mind. And, btw, she’s disabled the cameras in the hallway for 60 sections, so Burnham better beat her up and escape with her brother. Georgiou’s motives are still unclear, but Burnham doesn’t stick around to ask any other questions. And boy howdy do I love watching Michelle Yeoh do fight choreography. Burnham appears to knock out Georgiou, then grabs her phaser and runs. It’s crunch time on the shuttle. Stamets starts calculating the transporter coordinates manually, Pike initiates self-destruct, and Tyler is just repeatedly hitting the future tech with some kind of tool. Stamets sends over the coordinates, and with just a few seconds left, all three of our intrepid explorers are back on board. As the shuttle blows up, the mirrored screens on Discovery start flashing three red dots in a triangular shape. No one notices but Airiam, but they certainly seem to have affected her, and we see the same pattern flash in her eyes. Burnham enters Spock’s exam room, quickly shoots the two doctors (They’re in plastic lab coats. I didn’t mention that before. Plastic lab coats. ), and administers Spock a stimulant. After another brief encounter with Georgiou (she has to make it look good), Burnham and Spock board the shuttle and warp away. The shockwave from the shuttle’s explosion his heading towards Discovery with a “time tsunami” and they also get the hell outta Dodge, leaving Kaminar in their dust. (I sure hope that time tsunami isn’t going to affect Kelpien-Baul relations…) But with Disco out of danger, Pike and Tyler appear to come to some sort of understanding. Saru is analyzing the probe’s attack on their systems, trying to figure out what it was looking for. Considering that the probe and the Red Angel both came from the future, Pike is not reconsidering his belief that the Red Angel’s intentions are benevolent. And as we transition to the next scene, we see those three red dots blink in Airiam’s eyes, one more time. Leland’s attempting to reprimand Georgiou for Burnham’s escape, but you and I both know that’s not going to go over well. She lets Leland know that she knows he is the one responsible for Michael’s parents’ deaths. Huh? The Section 31 ships are looking for Burnham’s shuttle in an asteroid field, but miss it entirely. On board, Burnham has the computer search its database for the numerical string that Spock keeps repeating, but backwards: 749148. They’re coordinates. For Talos IV. Next week, Talosians! Plus some possible alternate futures.